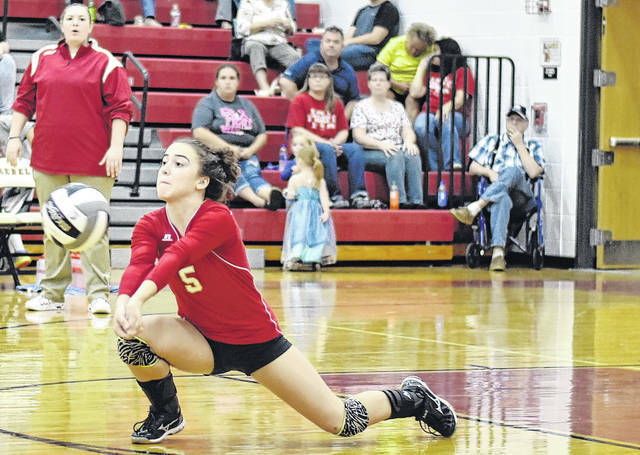 South Gallia’s Alyssa Cremeans attempts a dig during the Lady Rebels setback against Miller on Tuesday night in Mercerville, Ohio. MERCERVILLE, Ohio — Down to the wire. 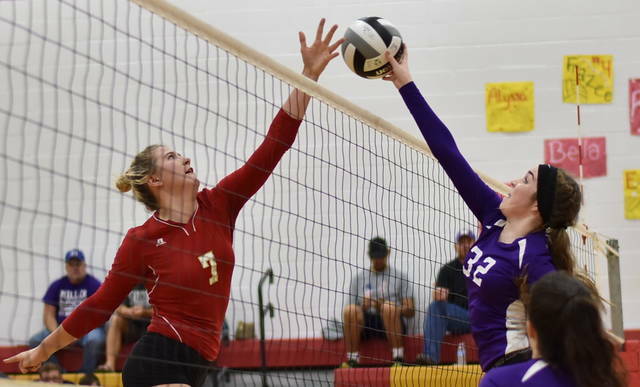 The South Gallia volleyball team lead 2-1 against the visiting Miller in Tuesday night’s Tri Valley Conference Hocking Division match in Gallia County, but the Lady Falcons rallied to take the final two games earning a come from behind 3-2 match victory. The Red and Gold (6-7, 4-6 TVC Hocking) jumped out to an early 15-7 lead in the opening game, but Miller rallied to close the deficit at 23-19. SGHS, however, closed out the set on a 2-1 scoring run en route to a 25-20 win. After 4-all tie in the second game, the Lady Falcons opened up a 15-8 lead, before manufactured a 10-4 scoring run to take a 25-12 victory. The third game was tightly contested, as the visitors leaped to a 5-1 lead, but the Lady Rebels utilized a 9-5 run to knot the game at 10. South Gallia outscored MHS the rest of the way 15-13 to edge out the 25-23 win. The Lady Rebels jumped to a 10-7 advantage in the fourth set, but Miller rallied to tie the contest at 15-all. The Lady Falcons controlled the momentum from there, outscoring the visitors 10-to-7 en route to a 25-22 to force a decisive fifth game. In the deciding game, South Gallia charged to an early 5-1 advantage, but the visitors managed to knot the contest at 6-all. From there, the two squads engaged in a see-saw battle for the lead before playing to a second tie at 11-11. Miller, however, earned the next four points to close out a 15-11 win and 3-2 match victory. The Lady Rebels service attack was led by Rachel Colburn with 14, including three aces, while and Christine Griffith was next with 11 service points, including one ace. Emma Shamblin followed with 10 points, including four aces, while Amaya Howells followed with seven service points, including three aces. Isabella Cochran and Makayla Waugh rounded out the SGHS service attack with two points apiece, respectively. Josie Perani led the way for Miller with 19 points, while Taylor Hinkle was next with 12 service points. Alaina Boyden was next with six points, as Josie Crabtree followed with five service points. Brookyln Wilson and Askya McFann were next with four points apiece, respectively, while Haile Joseph and Brooke Dillenger closed out the Lady Falcons service attack each posting three service points. As a team the Lady Rebels finished with 89 digs and 30 kills. 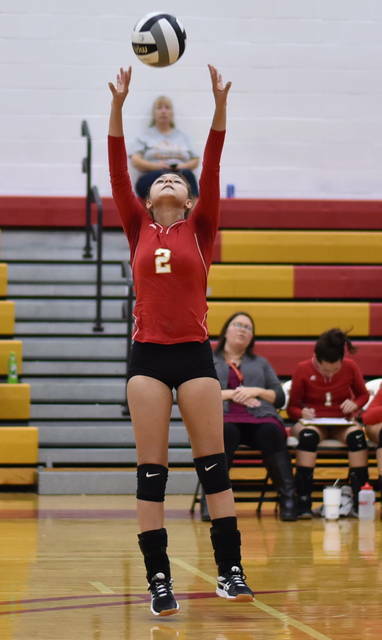 South Gallia finished the match with a serve percentage of 87.6. The Lady Rebels return to action on Thursday for a road date with Tri-Valley Conference Hocking Division foe Waterford.